Make the most of your workout! 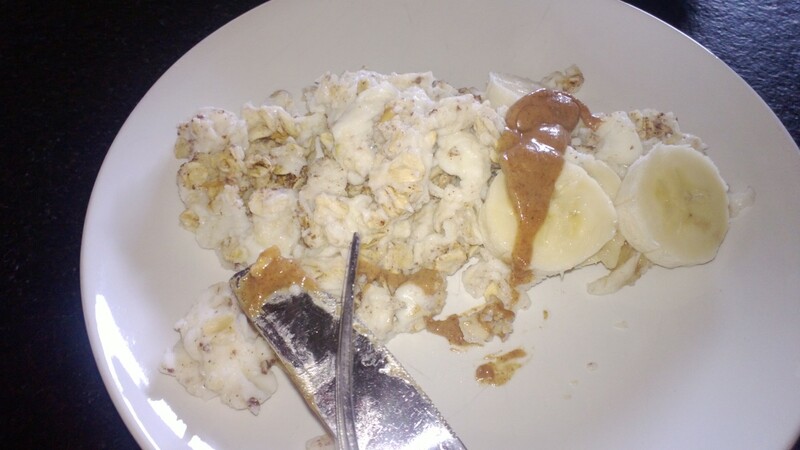 Egg Whites and Oats are a staple breakfast for figure competitors. I actually really like egg whites and oats, but they can get quite boring! Now that I’m officially ‘off season’ I can mix it up a bit! This will sound very weird, but it is RidicuLisious! (That’s ridiculously delicious, if you don’t speak my language). See, egg whites and oats when you mix them basically make a pancake like formation, especially if you blend them first – which I did not this morning, because I am lazy 🙂 But if you want yours to look pretty, blend first and then pour out into the pan like a pancake. You can even add some whey or casein protein if you need extra. Heat non stick fry pan and spray with butter/oil. Place first 2 ingredients (blended or unblended) in pan and cook 1-2 min (if blended mix, flip like a pancake, if you are doing the lazy way, just cook like a scrambled egg), until egg whites are cooked. Sprinkle with cinnamon, then transfer to a plate. Top with sliced banana and nut butter – and ENJOY! This entry was posted on July 30, 2013 by Samara (The Gym Coach & National NPC Competitor in Food and Diet. Visit The Gym Coach Store for fitness programs and more! Watch and Learn with our YouTube videos!